Here is a list of Frequently Asked Questions. If you still need more information, please do not hesitate to contact us at info@EmbracingHopeEthiopia.com . We would love to talk with you! If I must discontinue my family sponsorship, what happens to the family? If you must discontinue your family sponsorship, we will immediately start looking for new sponsors for that family. The family will continue to be provided with all services while we look for new sponsors. You may discontinue your sponsorship at any time simply by contacting us. How long does my family sponsorship last? While Embracing Hope Ethiopia educates children through Grade 3 in our schools, we are committed to walking with families longer term, both through direct services and indirect services we provide. While we hope that you will continue to sponsor a family for as long as you are able, we fully understand that it is difficult to make a long term commitment such as this. You may discontinue your sponsorship at any time. Please also understand that at times a family’s circumstances change too. This can mean that your family will end up withdrawing from the program along the way. This could be because of the complexity of poverty, moving outside of our service area, a change in family situation or because the life changes the program requires become too difficult. We do ask for your understanding when this occurs. We commit to communicate with you as quickly as possible should the family’s circumstances change. We’ll also offer you the opportunity to partner with another family who is in need. Sponsorship or Partnership. Which is it? While the two terms have become somewhat interchangeable, we prefer the image of partnership. Yes, you are sponsoring a family, but we believe partnership better encapsulates the huge changes that are required of a family coming into the EHE project. Moms are required to no longer beg, to save money, to develop relationships and to leave sometimes generational cycles behind them. They must fully participate in the program and therefore are doing their part. So, your sponsorship is not simply providing for their needs, but rather your partnership is empowering them to embrace dignity and the hope that will help them to do all they can to see a cycle broken for themselves and their children. It costs Embracing Hope $136 per month to provide holistic intervention to a family. However, we know that for many families it is not possible to afford this level of commitment. 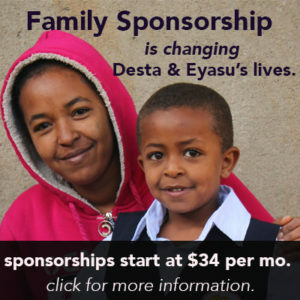 So, every family has 4 sponsorship slots of $34 per month. You can decide if you would like to sponsor 1 slot, 2 slots, 3 slots or all 4 slots for a family. Time after time we’ve had families who are willing to take 1 slot, but then they spread the word to friends and family to take on other slots. Sponsoring a whole family together as an extended family, Sunday School Class, small group or office group is a lot of fun and a great shared experience in sacrificing together in order to see a family in need served. Why is EH Family Sponsorship more expensive than other sponsorships? The main reasons are related to the intensity and the scope of the holistic interventions we provide. Below you will see some of the contributing factors. 1. Our family sponsorships are focused on providing for the whole family rather than focused on serving one child from a family. 2. We work with young children in a child care and educational environment that is open 5 days per week. This requires us to provide extensive staffing and facilities in order to provide a high level of care. 3. We have a well-trained staff that is able to provide dedicated, direct and safe care for all of the children in our program. Because of low staff to child ratios we are able to provide safety as well as build deep relationships with children and parents. A. Every child receives a nutritious breakfast, lunch and an afternoon snack 5 days per week. Severe Malnourishment is high among new arrivals. B. All children receive extra nutrition every day in the form of an additional snack. C. 20% of children receive Plumpy Nut or another intensive-nutrition supplement daily. D. Nursing Mothers are provided meals. For infants who cannot be nursed, formula is provided by EHE for the family. E. Day Care children receive Early Childhood Education. Children ages 4 and up receive free education and all necessary supplies through our School licensed by the Ethiopia Ministry of Education. F. Families receive supplemental food for home use monthly as well as hygiene supplies. G. Children receive new clothing 2 times per year, plus a winter coat and quality shoes. H. Children and their parents receive free medical care. I. Families with special health needs (HIV, TB, disabilities, etc) are provided with extra supports. J. Families are assisted in getting basic household furnishings (mattress, sheets, blankets) while empowering them to purchase some items on their own as a dignity builder. K. Mothers are provided with micro-grants, micro-savings opportunities, literacy training and the opportunity to learn a trade when appropriate. L. Social Workers provide ongoing care for the family emotionally, spiritually, physically, relationally and intellectually to help all members break cycles of poverty. M. Spiritual Ministry is provided for all family members who choose to take part. Parents are offered Bible Study and Spiritual counseling. Children are offered a Sunday School / Bible Club environment where they can learn about Jesus and come to know Him. N. We provide assistance as special circumstances arise: displacement, unemployment, house repairs when appropriate. O. We spend time and effort assisting parents in developing community among them. When beneficiaries are in a position to assist each other, it becomes a very healthy environment. Will I be the only person partnering with the family? Because there are 4 slots of $34 per family, if you choose to take all 4 slots, then you will be the only one partnering with the family. If you take less than 4 slots, there may be others who also are assisting in sponsoring the family. While we cannot allow gifts for children, we do encourage you to correspond with them and to send a Birthday Card for them. In that card you can include stickers, balloons or other “flat” items that are small, but meaningful. The reason we cannot allow gifts is because of the nature of competition among mothers. We work hard to break down competition and to help the mothers to build community among them. What this means is that we have to provide uniformity among children in what they receive, so that competition is not sparked. Every Birthday, children within the project do receive gifts. Their Moms (or themselves) depending on their age pick a few toys from various items that we receive throughout the year. Children also receive some items of clothing on their birthdays. If you would like to send items that we can add to the Birthday Gift Box for children to pick from, we welcome those items. While those items may not directly benefit the child you sponsor, a child in the project will benefit from and enjoy those items. What should I do if I am considering canceling my sponsorship? Please contact April our Family Sponsorship Coordinator at sponsorship@EmbracingHopeEthiopia.com. She would be happy to take care of your request for you. What specific benefits does the family I sponsor receive? How important is Prayer to a Family Sponsorship? We believe that prayer is one of the most important things that can be offered for a Family. Parents and Children are faced with very challenging circumstances, seemingly insurmountable obstacles and decisions that have the power of breaking them out of generational cycles of poverty or keeping them within those same cycles. So, please pray for your family. Every year at Christmas time you will receive an update photo of the child in the mail. Please post it on your fridge or bulletin board where you can remember to pray for them. Your prayers make a huge difference. In many of the family updates that are emailed, you will also find items to keep in prayer and at times very specific requests from Mothers. If there are urgent items that arise along the way (medical issues, relational issues, etc.) we will email you with a prayer request, so that you can be praying through this season with the family. As a Family Sponsor, how can I learn more about the family I am partnering with? Three times per year, you will receive something about your sponsored family. One time per year we will send a Family Update. One time per year you will receive a picture or letter from your child. And at Christmas time you will receive a Christmas card with an updated photo of the child. We also will keep you updated on special prayer requests along the way as large prayer needs occur. We also encourage you to subscribe to Embracing Hope Ethiopia’s bi-monthly newsletter and to visit our blog. In both of these places we share more information about the Kore’ area, Ethiopia and poverty in general. You can receive the newsletter by clicking here to sign up. Can I visit the family that I sponsor? Absolutely. If you find yourself in Ethiopia, we will try to arrange for you to meet the family you partner with, if possible. This meeting will happen at the EHE Day Care or the EHE School and must be coordinated for a time when the Mother would not otherwise be working. Please contact us at sponsorship@EmbracingHopeEthiopia.com at least 2 weeks in advance so that we can coordinate a visit and arrange for translation. Please Note: we are not able to take foreigners into the homes of families in the project, because this can provide complications for the family resulting in increased rent and unjust actions from neighbors because an assumption is made that the family visited has financial connections that can be taken advantage of. How can I communicate with the Family I sponsor? We encourage you to write to the family you sponsor a couple of times per year. You can either send a letter or card through the mail or you can send an email. To email a note, please send either to sponsorship@EmbracingHopeEthiopia.com or you can use our Write My Family link on our website and fill out the form. When your letter is received, it will be translated by our staff and then given to the Family. Please do not put the family’s name on the outside of the envelope, because this can cause it to not be delivered. Please include the Child Name, Parent Name and Family number inside of the envelope. Will The Family Write to Me? If the child is in Kindergarten or older, you will receive something from the child one time during the year. At times this may be a coloring page or piece of art they made. At other times it may be a short letter that they wrote as part of a school project. We believe that there are a few distinctives about EHE’s work. Our work is local based. We are totally Ethiopian run on the ground. Because of that we adapt quickly to changes that are constantly occurring. Our work is holistic. We believe in addressing the needs of the whole Child and Parent. This means that we pay close attention to Intellectual, Emotional, Physical, Relational and Spiritual Needs. We share Jesus in Deed and Word to family members, many of whom are far away from trusting in Jesus. Our work is Personal. We believe in giving great ownership to the beneficiaries within the project. So, we listen to Moms and their concerns, and then we make adjustments as needed. Moms are the voices we believe we must listen to, if they are going to have buy-in and commitment to breaking out of cycles of poverty. Our work is Sacrificially Funded. We believe that everyone who gives to EHE has sacrificed at least in a small way to make it happen. We do not receive government funding nor grants for our work, but rather we exist because of churches and individuals who give some. This means that we take great effort to be careful stewards of what has been sacrificially given in Jesus’ name. Our work is Jesus Centered. Everything we do is done to show the love of Jesus to a Mother and Child. Our staff are trained to share Jesus in deed through their actions. We expect that Moms and children will be treated with dignity and respect at all times so that they will see we are Jesus followers by our love. Through our Spiritual Ministry we are able to also share Jesus in Word. We want Him to be lifted high – and for Moms to see and respond to the hope that we have in Him. Where does Embracing Hope Ethiopia work? What is Embracing Hope Ethiopia’s legal status? Embracing Hope Ethiopia is a registered 501c3 organization in the United States, making any contributions made by individuals or organizations in the United States tax deductible. In Ethiopia, EHE Development is registered and licensed as a local Ethiopian Charity / NGO. This licensing is through the Federal Democratic Republic of Ethiopia Charities and Societies Agency..
EHE Spiritual Ministry is registered and licensed as a Spiritual Ministry through the Federal Democratic Republic of Ethiopia Ministry of Federal Affairs. All registrations and licenses require audited statements at least yearly. What Percentage of My Sponsorship Reaches the Ground? Over 95% of your Family Sponsorship support is earmarked for the project in Ethiopia. We take out a small amount for administrative costs, but the majority of those costs are raised separately through other EHE fundraising efforts. If you give by credit card, the card processor also takes a processing fee. If you give by debit from your account, only $0.25 is taken as a processing fee. Are my contributions to Embracing Hope Ethiopia, including my Family Sponsorship donations, tax deductible? Yes, 100% of your gifts given to Embracing Hope Ethiopia in the USA are tax deductible since EHE is a 501c3 registered Not for Profit in the United States. In Canada, your donation is also tax deductible through our partner, The Bridges of Hope. Unfortunately, if you are giving in a country outside of the USA or Canada, we are not able to offer tax deductions in those other countries, yet. Is EHE affiliated with any church or denomination? No, EHE is independent of any affiliations. Our Board of Directors and Staff, both in the US as well as in Ethiopia come from a variety of backgrounds with many of them from the evangelical stream. 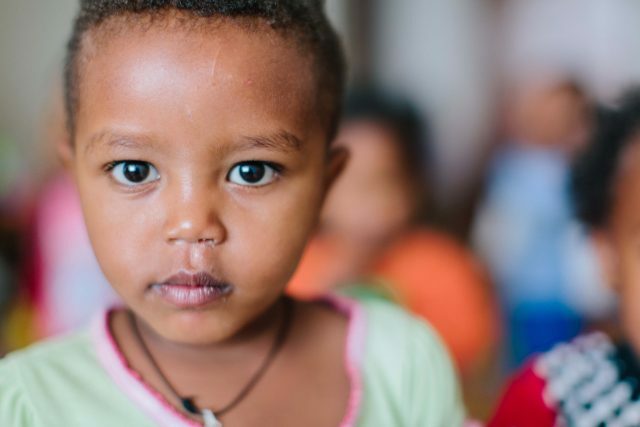 Our work in Ethiopia benefits Mothers and Children regardless of their religious affiliation, with 80% coming from Ethiopian Orthodox backgrounds and approximately 10% Protestant and 10% Muslim. While we do not have a church or denominational affiliation, we would believe in the vital importance of a person coming to the place of putting their faith and trust in Jesus Christ as their Lord and Savior. How does EHE handle Finances? Embracing Hope Ethiopia – USA is the funding arm for Embracing Hope Ethiopia Development and Spiritual Ministries. Every year both the development and spiritual ministries develop a budget that is submitted to the Ethiopian government. Once approved, EHE USA then works these numbers into its yearly budget in addition to raising money for administration costs, missionary costs, fundraising costs, etc. Both EHE Development and Spiritual Ministries aim is to fully fund their projects through Family Sponsorships. So, Family Sponsorship moneys are what fund these projects in their work on the ground. On the Ethiopian side, EHE Development must submit a 3 Year Proposal that includes all details of the program for a three year term, down to and including staff salaries as well as how much we will spend on toilet paper. This approved proposal becomes the guideline for the next year’s budget. EHE then must submit both financial and activity reports on a quarterly basis to the appropriate government offices. In addition, EHE must submit audited financial reports every year, audited by an independent certified audit company. EHE Spiritual Ministry must provide a yearly budget as well as a yearly statement of financial and physical activity. This Financial report must be audited by an independent certified audit company. In the US, EHE conducts a yearly financial review conducted by a certified public accountant in addition to Form 990 that is submitted to the Internal Revenue Service. EHE is registered with the Bureau of Charities in the State of Pennsylvania and must yearly file a BCO-10 form with them. All documents can be provided on request. In Ethiopia, both EHE Development and Spiritual Ministries are overseen by their own separate Board of Directors and General Assemblies. All members of the Boards and General Assemblies are Ethiopians. In the United States, EHE is overseen by a Board of Directors, comprised of professionals who have deep hearts and extensive experience caring for the poor around the world. Can I view the most Recent Audited Financial Review for EHE? Sure you can. 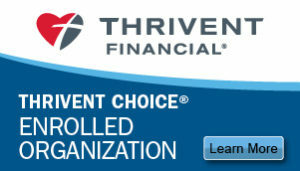 Click Here and you will be taken to our most recent Financial Review. How can I promote the work of EHE? We need your help in spreading the word! We have folks who we refer to as EHE Advocates. These are people who look for opportunities to share about the work of EHE, raise awareness, fund raise and do the hard work of advocating on behalf of the poorest of the poor with churches, social organizations, relational circles – and anyone else who will listen. We have videos, print materials and social media ideas that can help you to promote the work. Willing to become an Advocate? Drop an email to April at sponsorship@EmbracingHopeEthiopia.com and join in preserving families and preventing orphans.